Winner of the Israeli Film Academy Ophir Award for Best Picture and propelled by the craft of Ronit Elkabetz (LATE MARRIAGE, THE BAND’S VISIT), one of Israeli cinema’s most acclaimed actresses, Gett: The Trial of VIvian Amsalem is an uncompromising, heart-rending portrait of a woman’s struggle to overcome an unmoving patriarchy and live a life of her own design. 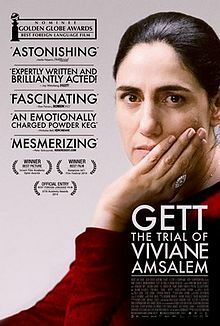 It’s the story of an Israeli woman (Ronit Elkabetz) seeking to finalize a divorce (gett) from her estranged husband finds herself effectively put on trial by her country’s religious marriage laws, in this powerhouse courtroom drama from sibling directors Shlomi and Ronit Elkabetz. In Israel, there is neither civil marriage nor civil divorce; only Orthodox rabbis can legalize a union or its dissolution, which is only possible with the husband’s full consent. Trapped in a loveless marriage, Viviane Amsalem has been applying for a divorce for three years but her religiously devout husband Elisha (Simon Abkarian of CASINO ROYALE and PERSEPOLIS), continually refuses. His cold intransigence, Viviane’s determination to fight for her freedom, and the ambiguous role of the rabbinical judges shape a procedure where tragedy vies with absurdity and everything is brought out into the open for judgment. Co-director Shlomi Elkabetz stops by to talk about this remarkable film and the impact it is having on Israeli society. This entry was posted in adaptation, drama, dramedy, Film School interview, foreign, Indie, Spirit Award nominee by admin. Bookmark the permalink.